Medical Centre Appointments Now Available Alternate Saturdays. For your convenience and to provide the best possible access to your GP, Medpods has bulk billing available. All you need to do is bring your Medicare card with you for your consultation and present this to the Receptionist on arrival. If you are an overseas visitor and do not hold a Medicare card, there will be a consultation fee incurred which can be discussed with the Receptionist prior to your appointment. Please note that for Medpods Medical Centre to continue offering a high quality of service, an annual $55 membership option has been introduced for those wishing to continue with bulk billing of their appointments. 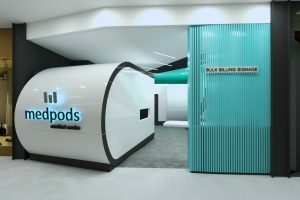 To see the membership policy for Medpods, click here. Medpods gives the option of booked appointments either online, via phone or in person at the clinic OR you may decide to present to the clinic as a walk in patient. Our friendly Receptionist will assist you with your booking and advise you of an approximate waiting time. If you are dropping in while shopping, we will send you notification when you are due to return for your appointment to make the process as easy and flexible as we can! We also have 15 minute appointments to allow you ample time to spend with your GP and work through any concerns. If you feel that this time will not be sufficient or you are requiring immunisations, minor procedures, insurance or Centrelink reports or any other service requiring additional time, please advise the Receptionist when making your appointment and we can extend this time for you. Your Medpods GP will advise you when your result is expected and ask you to book an appointment for this time. Should you wish to call the clinic and check on the status of the result please do so. However, our Receptionists are unable to provide results over the phone, due to confidentiality, and will let you know if you need to book in with your GP. As a regular patient of our practice, Medpods offer the ability to request a home visit. If you are unable to attend the clinic due to your health, please call and speak with our team to discuss how we can help. Medpods has partnered with National Home Doctor Service to provide your after hours care. If you or your family suffer illness outside of our practice hours, please call 13 74 25 ( 13 SICK ) and a GP will be sent to your home to provide care. Medpods appreciates all patient feedback as an opportunity to reflect on the care given to our valued patients. If you would like to provide personal feedback please ask to speak to the Practice Manager when calling the clinic. You may also like to complete a patient feedback form located at Reception. If language may be a barrier between you and your Medpods GP, we are able to organise interpreter services. TIS provides interpreters if English is not your primary language. You can advise your Receptionist when booking your appointment or call 131 450 to arrange prior to arriving at your appointment.